We’ve been going thru a lot of our clutter lately. I am not sure not this accumulates in the quantity it has, but I can allot a bit of it to all the stuff I brought back from Arizona in January. But, that made me spur into action and roll them all to take them to the bank. (For my friends outside the US, dollar coins have never really caught on here, even though they are in circulation.) And that made me also roll up all the other change I had accumulated in my pickle jar…and voila! I made $671! 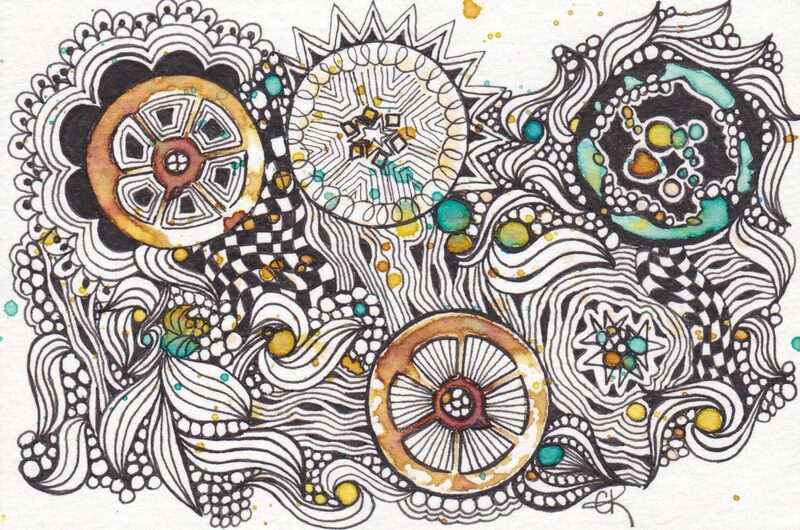 I know what you are thinking…Charlotte, what has this got to do with Zentangle? Clutter is not only something that accumulates physically. Mental, emotional, and physical. And it builds up, and keeps us from being our best selves. I struggle to get things done on my super cluttered desk because it does not invite me to be creative. It invites me to see the clutter. The clutter depresses me and makes me not want to work on things I know will make me less depressed. Just the simple act of organizing and picking up can be so freeing, mentally and physically. Spacious freedom in your mind and in your home. Now, I am not going all Marie Kondo method on you. I’m an artist. I have stuff. I think I may have come up with a new tangle I am calling Zigmajig, a cross between Keeko and Jonqal. Neato, eh? Oh, and if you have ever seen this by another name, I’m happy to give it up. I had a couple of awesome playdate/classes this week. On Monday, Pam and her daughter came and played with me for a few hours. We learned a few things and had a lot of laughs! And on Wednesday, I taught the first of 2 sessions for the San Diego Book Arts Guild at the library in Pacific Beach. I had 15 lovely ladies tangling on coasters for a high altitude flyover of Zentangle…just enough to wet their appetite for more! They did an awesome job. And while I know it’s not spring-like weather in some parts of the country, after my class I walked along the beach for a while, and enjoyed a sunset. Remember, there is still time to use the code MAR15 for 15% off at the online store. And now, I have to clear the clutter of accounting work, so I can submit my taxes for the year…icky!